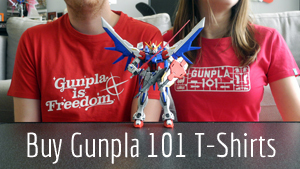 What do you do when people tell you not to build a Gunpla kit? Well, if you’re Dustin, you build that kit anyway! MG RX-78 GP02A is one of the older kits in the Master Grade line and it doesn’t have a great reputation among builders. Here, Dustin gives it a try anyway. I’ve been told for a number of years that the MG RX-78 GP02A is not a good kit to build. I’ve always heeded those warnings… until I decided to throw caution to the wind and buy the kit myself. In terms of stability and balance, it’s solid like a rock. But to anyone who knows how rocks work, its possibility is only limited. The one good thing about rocks is that you won’t have to worry about them tipping over at the slight breeze of the fan running in the room. Unlike some kits I won’t name that might collapse just being looked at, this one’s strength is its sturdiness. Visually, the GP02A has got a bulky feeling to it. There’s no concern that it’ll fall apart if you so much as breathe on it like some of the later Katoki kits I’ve come across. But in that strength it sacrifices any semblance of beauty. The only delicacy is in the features on the head unit. Everything else is formed from blocky pieces of plastic. Something positive to be said for this characteristic is that it is certainly accurate to the even chunkier original, shown in Mobile Suit Gundam 0083. The GP02A is not made to be a pretty protagonist mobile suit, but a literal walking tank. On that front, I feel this kit captures that essence very well. The base colors are also anime-accurate to how the mobile suit looks in Gundam 0083, and the injections of the colored plastic to a majority of the body is where it should be. Of course, this is easier than usual because there’s not much color to begin with. The brightest part of the kit can be found in its stickers—thick yellow lines that detail the shoulder thrusters. In lieu of stickers, the builder could also easily opt to paint these wide grooves. Actually constructing this kit wasn’t the hard part. The real difficulty lies in some of the functionality of the pieces. In the instructions, it’s clear that you can have the shoulder cannons facing outward while the massive cannon is fully displayed in attack mode at the same time. But getting the kit itself to match the instructions was my biggest challenge. In fact, this defect became my main pet peeve on the kit that I had to correct. After completing a straight build, I quickly discovered that the back right shoulder—where one part of the cannon is connected to—cannot have the cannon extended over the shoulder while the thrusters are out at the same time. The instructions make it seem so easy to do, but somewhere in this kit’s creation, between the designers’ work and the writing of the instruction manual, there must have been some major miscommunication. So like the good craftsman that I think I am, I decided to just say “Eff this” and cut off the plastic piece that was interfering with the piece holding the part of the cannon in place. Only then was it possible to move the thrusters outward while the cannon was extended over the shoulder. That seems to be the only viable solution to follow along with how the damn manual told me to do it, and it’s my kit so I’ll treat it how I want to. As you can guess, this was a particularly frustrating part of the build for me. … But the instructions don’t match the reality of the kit. Did you know the Master Grade line began in 1995? That means the GP02A, released in 1998, is one of the earliest MG kits ever created. In fact, it’s the 13th Master Grade kit ever released. Happy 20th birthday, GP02A! Back then, Bandai was still playing around with how much movement an MG kit should have. The arms have that early “don’t ever bend past 80 degrees” mechanic, which hinders its full motion to grip the handle on the cannon properly. Between the joint of the wrist and the elbow joints, I haven’t been able to get a solid, comfortable pose for the GP02. I feel the legs have more joint movements than the arms, when both should be about equal on a later MG kit. This kit includes beam sabers which are stored in the side waist pieces. I found them tricky to remove once they are attached, so I have to be careful in prying them out. The shield, while accurate in proportion, is still too heavy for the joints of the arms to hold in place. Part of the design for the arms makes them too weak to hold the ginormous shield without it falling out of the hands. So, like the grand model kit craftsman that I am, I decided to encase that left hand with a ton of super glue in order for the shield to stay in place. I’ll never use that left hand for anything else, so to me, it serves its purpose quite well. As you can see from my critical viewpoint of this kit, I would only recommend the GP02A to people who really want to build and collect GP02 Gundams. It’s far and away from being a terrible kit—20 years ago when it came out, it was maybe even a good kit. However, times have changed and Gunpla has improved greatly since. Now this kit is just a relic of the past, a hint to how the Master Grade line started out. My main praise for this kit is that it gives me no problems now that it’s been built. I don’t have to worry about it being really delicate, or worry that something is going to pop out for no reason and I’m left on all fours looking for small pieces every time I want to move the kit from one location to another. And if you’re a fan of getting kits with tan vinyl figures in them, this comes with a tiny Anavel Gato figure that you can paint. Most of the Gundam 0083 Master Grade kits came with small figures that included Nina, Kou, South Burning, and Gato. So if you’re down for collecting vinyl figures, here’s one more kit to add to that collection. It’s really hard for me to recommend this kit to a first time builder of Master Grades, but for someone who wants a solid older kit that will sturdily sit on the shelf, I can vouch that the GP02A will be the good pet rock it is next to your other, more poseable Master Grade kits.